Now that summer is coming to a close it's a great time to utilize what little time is left of the warmer months and be sure to make the most of the backyard room. All summer long you have been using your backyard room to entertain guests, for romantic nights in and spending time with your family; so let's reflect on the relaxing times we have had this summer and see if we can end summer with a bang! Among one of the most relaxing activities to do in your backyard room is the very popular hot tub therapy. There is nothing more luxurious than soaking in your hot tub at the end of the day. No matter the time of year this beautiful addition to your backyard room can be used for guests, family and the ultimate hydrotherapy. Day or night, a hot tub is a great excuse to get all of your friends together. Another great excuse to utilize your backyard room, is none other than a not so old fashioned cook out! The idea of inviting a bunch of people over to your house can be very overwhelming. Especially if you have to cook, clean, and host. The best solution to this problem is a potluck hosted in your beautiful backyard room. And since your backyard room has been waiting for people to grace its presence all summer long, the only thing left for you to do is tidy up a little and add some finishing touches. A great idea for decor is to section out an area of your backyard room where people can congregate for activities that everyone might not want to be a part of. In this case, cigars and scotch. That way, if you aren't much of a cigar or scotch person you can steer clear if you aren't interested. If you are hosting a more romantic or formal occasion a great way to build up the ambiance and heighten the experience, is with the inclusion of decorative lighting. Remember, you don't have to go out and buy all new lights. A simple solution to this is going in your garage and rifling through the Christmas decorations boxes to find a simple string of lights you can hang up in your backyard room. It is also important to note that you don't need to buy new dishes or cutlery for your cook out. To spice things up you can just grab the finer dishware and set a beautiful table with centerpiece. In addition to a beautiful backyard room cook out, another great activity to try if you really want to end summer with a bang, is camping in style in your backyard room. 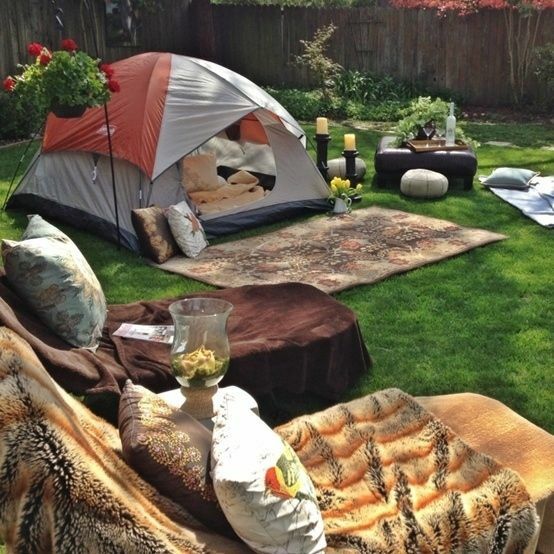 Setting up a camping area to enjoy on a warm summer night is the perfect way to utilize your backyard room this summer. No matter how much space your backyard room has to offer this fun idea can easily be achieved. In the case that you are just looking for a quiet hideaway, simply draping a canopy over a rope you laid out in your backyard room is an easy way to set up camp as well. By adding any or all of these ideas to your bucket list for the last of summer you will finally be ready for fall with no regrets. Let's end summer with a bang and look forward to what's to come: pumpkin spice everything!